I thought I'd explain some more about the Open Pixel Platformer project. I have been in contact trough private messages with many of you, but it couldn't hurt to put the conclusions out here. Way back there was the PJ game. A plan that was suggested multiple times and once there even was a collection of sprites and tiles made around the PJ nerd. Lack of organisation made the participants give up hope. Also, there have been many many open source community build game projects that have a lack of artists. They find it hard to attract creative minds to their plans and the games often lack originality. It is time for an art focussed community game to rise. A game where artists get to decide how the game will look and feel. Creating a game is a lot of work, the goal of creating a game is still far far away. 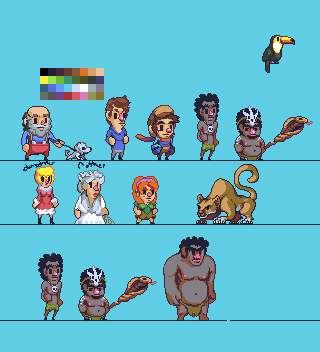 Therefore we start just with the first step: creating a CC-BY licensed tile and spriteset. Even if the final goal of a complete game is never reached, we give a quality tileset to the community. After bouncing ideas back and forth with many PJ members such as Surt, Skeddles, Flyguy, Gecimen, RileyFierey, Dawnbringer, Ellian and many more the decision to create a multiverse platformer set was made. Thus, the open pixel platformer was born. There is a palette, there is a style guide, so we can get started on content creation. I have opened a jungle set which is open to contribution of all kind. Anyone can open a set as well and moderate this, as long as all the content gets CC-BY licensed. I will package the tiles nicely so that they are well sorted out & easy to use. Also this package will contain information about its creators for proper attribution. Of course it is fun and practise to make pixels. Also many artists like me enjoy seeing their work used in computer games. Since all artwork is CC-BY licensed it is very likely that this will happen in one way or another. As everyone is free to edit your work you might get to see your art from a different direction, an experience to learn from! Of course in any use of this art the creator(s) should be attributed, the OPP might make some advertisement for you! Last but not least, does it not feel great to give things away? So how about giving things away to the world? That you have made yourself? This gift might stick around until the end of time! Once some basic tiles are done, the next step is to get some people to look into game design. I hope to get this discussion going over at TIGsource.com , who have experience designing the TIGbrawl game. A story gets written, charters are designed, game objectives are set, etc. This will allow the artist to have a better image of what needs to be done. 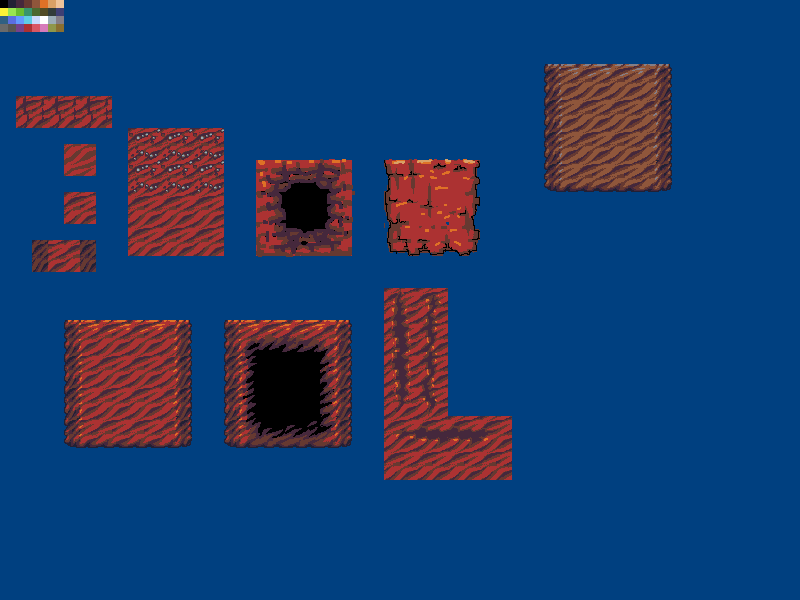 For example, it is good to know if your tileset needs signs, breakable blocks, pushable objects etc. Also collectibles, powerups and whatnot needs to be drawn, but this can only be done once the game design becomes more clear. If the designing phase goes well and the required sprites and tiles are getting finished we might attract attention from interested programmers looking for a challenge! Of course it might also very well be possible that programmers start working on games with our material without our great plans. After all it is CC-BY licensed and everyone can do with it whatever they want. The future will tell what happens :). In the future the OPP might get it's own website where artists who contributed a lot of material get exposed, you can download art packs for free and join the OPP discussion forum. Can I submit art for the OPP to the PJ gallery? The point is to make a free to use set. For this it needs to be obvious that the set is free. Of course all creators get attributed! Leave ideas, plans, encouraging comments etc below and of course, contribute! Since I don't want to make a thread for this project myself (I don't want to step on anyone's toes), how do these fit in with the style/color guide? 23 colors and a transparency, all objects 32x32. Feel free to make edits/changes if you like. Crates will always come in handy at some moment! Try to avoid dithering in objects and characters, only in backgrounds there could be minor dithering. Also try and avoid black (out)lines, choose a dark color closer to the object color instead. I made a quick edit showing what I mean. As you can see in the second image the dithering is removed and the outlines are changed. The second thing I did is not in the style guide, this you will learn with experience. From straight front this object looks a bit boring. For this reason I have turned it around for a tiny bit. 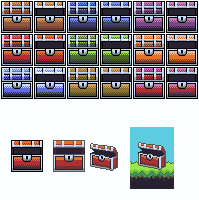 I took your advice to heart and did a few edits to the chests on both the outline and coloring styles. 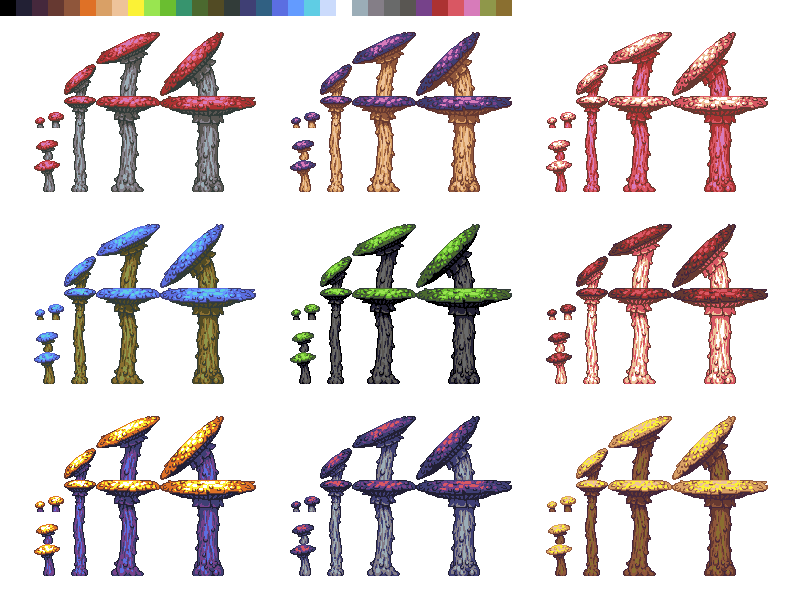 I also used the crossdither chart found in the thread for the DB32 palette to craft some new colorations for the chests with slightly better gradients. One on pixelation and one here on PJ. On Pixelation the theme will be 'cave', and will of course match the style of the jungle set. Stones, torches, stalagmites, crystals, maybe mining gear, maybe a hidden underground labaratory, bats, spiders, maybe lava etc etc. Should I try and create some base tiles for this, does someone else want to give that a try or should a template be sufficient? What theme should a new set on PJ have? All suggestions are welcome. Ice age: dinosaurusses, fred flintstone buildings, fires, frozen trees etc. Please suggest something cool for a new OPP set! I'd go with something that fit the jungle/cave theme; not as an extension (the goal is to have different themes, right? ), but as something that would smoothly transition to either jungle or cave. I mean, you wouldn't jump straight from sci-fi to western. Might as well try to have something that would quickly go together? I'd go with a village, since jungle/cave already are... well, gameplay/exploration/fighting areas. Medieval/Victorian/Ice age (without ice?) town? That, or underwater world (could be easy to jump into a lake when you reach the end of the jungle area, and/or have your cave lead into the ocean or something). Ellian, you are my favorite idea man ever :). I agree that a village area would be practical. Maybe the Western desert has to wait for a bit? The medieval village would possibly be easier to connect to the jungle.. I started making tiles for a medieval house. Going for the tudor style. I'll post the tiles when I'm finished and when the topic is up. I am looking for someone who would be interested in moderating the second thread. NumberPlay, Would you perhaps be up for this? I'll be back to helping from Saturday onwards. I started making tiles for a medieval house. Going for the tudor style. Well I submitted it to the gallery. Do I need permission to start the village thread? this is very very nice and Of course it is fun and practise to make pixels. Also many artists like me enjoy seeing their work used in computer games. Since all artwork is CC-BY licensed it is very likely that this will happen in one way or another. Adding some two cents: How about a cemetery/graveyard level? I can see a solid connection with a town/village level. You should have posted this as an idea in the village thread. Maybe it can work as a level alone but sometimes it fits nicely in a village. I'll add it in the thread. A programmer and myself are working on an endless runner game project geared towards mobile that is using some of the current Open Pixel Project graphics. Introducing Codename Zookeeper! I wanted to let people here know so that you could see what your amazing work is contributing to and to insure that I was appropriately crediting this group. The game is obviously in very early stages and doesn't even take advantage of all the currently available OPP graphics currently up. I look forward to seeing what else comes out of the OPP and perhaps making some contributions to the graphics bank. 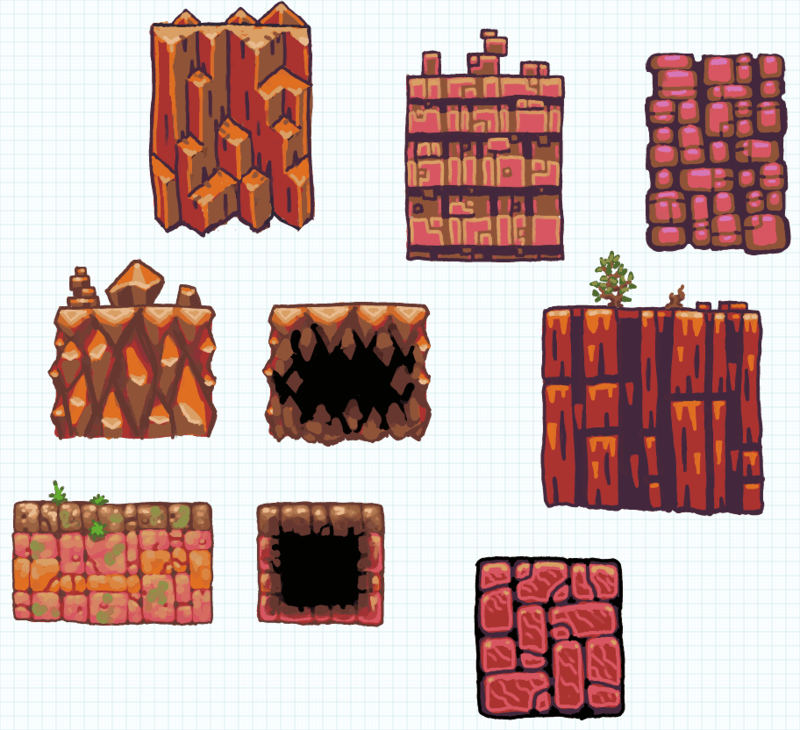 Been trying to start a cliff/mesa type tileset. First attempt didn't work, though may be redeemable for some underwater rock. Tried a few concept thumbs but none of them really feel to work with existing OPP stuff. the redish one, could go for sand, IMO. I like the edged tan stone. maybe they could become some nice edged marble pillars? not sure about the doodles. maybe add some smoother transitions, and in the case were it is meant to be a platform to be faded into black? also incorperate blank/one color tiles a lot, with this, I would say. some of those textures do look pretty interesting though. If I have an idea for a set I wanna post, would that mean I monitor the thread myself? Or do I just suggest it? Yes, you could start a thread yourself though I think there is enough going on at the moment. Suggesting it here first would be a great idea nonetheless to see if there are people interested in your idea! Ah yes, I realize that; At the moment I'm busy contributing with the village set, I was just curious for future reference! Once things calm down a bit I do have some idea's to share though. Should perhaps an aditional character thread be created so that these can be finished, animated, etc? They are mostly not really set related anyway. Anyone up for starting and monitoring it? I put that skull in a body.. is it ok? Even though not is style, I really dig those ! Maybe you OPPers might want to open a store and just have your sets available for free or the most minimal amount possible which would generate usage of all your great work and the site can offer real cheap quality pixels which they probably won't mind.